From Oil Paints To 400 Kinds Of Beads, This Store Is A Treasure Mine For Every Artist! Itsy Bitsy has everything from satin paper and oil paints to decoupage kits and glitter. The store houses every artistic item you can think of and more starting from INR 50! Walk into this store and brace yourself for the wave of inspiration to hit. Itsy Bitsy, a chain store that’s already popular in Bangalore, has all the stuff you artists out there need. They have the basic stuff like canvas paper, eight different kinds of paints, colours, glitter, but that’s not all. They have craft items too, and they are all super affordable! Want those cute lanterns with serial lights on your curtains? Well, this store sells the finished lantern balls made out of wool. All you need to do is wrap your lights around them and voila- pretty bedroom lights! They also have stitching kits, calligraphy sets, candle making materials, a great shell collection, tassels, ribbons, woven texture paper, and even a can that makes fart noises starting just INR 99! Oh, and their bead collection is WOW with more than 400 types of beads and pendants made of acrylic, glass, and plastic. 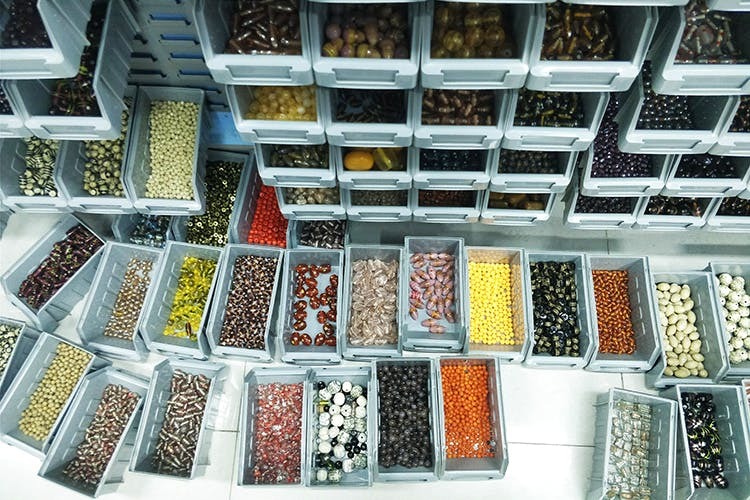 If you love jewellery making, you’ll never leave the bead section. They also sell really cute cards for birthdays, anniversaries, and more. So, head down to Itsy Bitsy and hoard up on some amazing art materials before they sell out!